Welcome to the New Season! A new season is upon us and I am ready to make this the best one yet! I have been updating the Facebook page and YouTube page with videos and pictures from the end of last season as well as videos from my 10 year archive. You can access those from the tabs up above. Please feel free to "Share", "Like" and "Subscribe!" 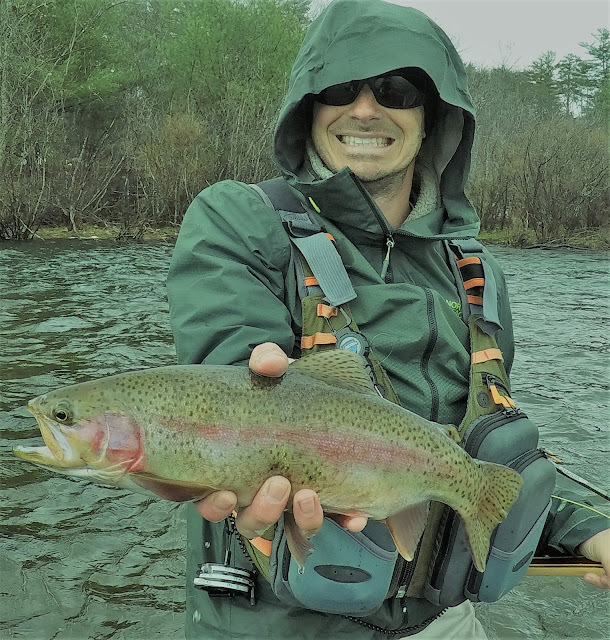 We will be at the "Fly Fish New Hampshire Show" on Saturday February 23rd and I look forward to chatting it up with everyone! I will have some flies with me as well as my Fly Show Deals for booking a trip as well. My books have been filling since late last fall and my "Prime Dates" are filling fast by my yearly clients. I still have lots of great Pittsburg openings for the summer as well as a few early season "lake run" fish trips. If you are interested, be sure to get in touch soon! The blast of 50 degree weather we had earlier in the week certainly got my fishing blood pumping and once we hit March, it is game on! If you have any questions or just want to chat fly fishing, you can always get me through email or on the phone. If you have ever wanted to check out the great north woods and Pittsburg New Hampshire fly fishing, make this year the time to do it! Thank you as always and keep in touch! I know it seems like a long delay in posts, but such is life! Since the last update I have become a father and have adjusted well to the new schedule! I have made a few big updates to the Website and wanted to share them with you. First off, I added a link to the brand new Fish Story Guide Service YouTube page. This is where I will post an archive of videos from all of my fly fishing adventures. I have years worth of videos that I am in the process of uploading and would love to get more subscribers! Next, I put a link to the official Fish Story Guide Service Facebook Page. This is where I actually do my most regular updates and posts. I put videos, pictures, stories and more on this page all season long. If you want the latest and greatest, this is the place to go! This is also the best way to get ahold of me quickly during the season. I have already started booking many trips for 2019. If you are looking for specific "prime time" dates, now is that time to get in the books! If you have any questions feel free to let me know! I hope everyone had a wonderful fishing year and I can't wait to get back out on the water with you in 2019! Spring / Early Summer Update! Hi everyone! I just wanted to make a quick update here on our spring/early summer fishing. I am posting regular videos and pictures frequently on the Facebook page, but I wanted to get things up to date here as well. It was a great spring with water flows just about at the perfect level, but I was really looking forward to getting back up north! I am finally back living in Pittsburg for the summer and within the first week of guiding, I could tell that the conditions are exactly where they are supposed to be. We have been all over the trophy stretch and other less known areas of the river. The fish have mostly been rainbows in the 8-12" range with a few 14-16" fish thrown in to keep it interesting. We found some browns, brookies and even still some nice salmon in the mix as well. We even got out in the canoe one evening trip for the Hex hatch. Here are some of the nicer fish of early summer in Pittsburg. We are back in action! I got out today for a quick scouting trip and found water temps hovering around 40. 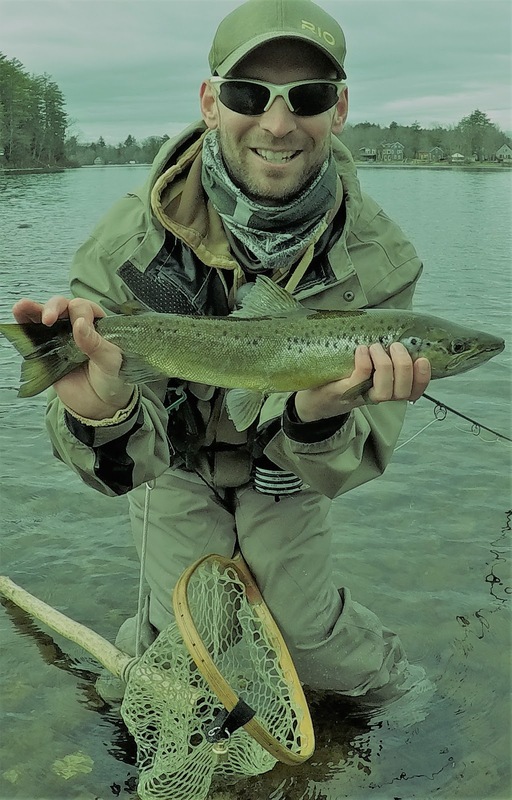 We need a bit of warm weather to really get the fish moving, but as you can see there are some to be had if you work for them! Looking forward to the start of the guiding season next week! Things are shaping up and should only get better from here! I am still booking trips for Pittsburg this June, July and August, so if you are interested in learning a new skill, technique or area, please feel free to let me know! Check back often as the fishing reports will be coming now that the season has officially kicked off! If you have any questions at all please email me and I will be happy to get back to you! It is about time. Time that I update everyone with how the late summer and fall season went up in Pittsburg. But it is also "always about time." How much time we have to do the things we love to do and how much time it takes to accomplish the things that allow us to do it! Confused yet? That pretty much sums up the whirlwind of everything that happened this fall for me. The plan was to have a normal and relaxing fall and make some big life decisions come next spring. Life had other things in mind and my wife and I decided now was the time to sell our house in Raymond and move a bit farther north to Loudon N.H. All of this took place right in the middle of the best fall fishing season and some sacrifices were made in order to accomplish the goal. The best way to describe my fall was organized chaos. I had all the plans in place, but I needed to execute the plans at exactly the right time. Ah, there it is again. TIME. Even with all of the craziness, I still did have enough of it, to get out on the water and have a blast with a mix of new and repeat guests. I could go on and on and tell you all of the stories from each of these fish, but they say a picture is worth a thousand words! What I will tell you is that I had some of the most enjoyable trips of my guiding career this summer. Not because of the fish that were caught but because of the people I was able to share the time on the water with. Once I headed back to my teaching job in late August, as I mentioned earlier, time on the water became a bit tricky to find. That didn't stop us from fitting in a few last minute trips to see what September and October in Pittsburg had up its sleeve this year. The fall colors of a brook trout and spectacular leaping ability of a salmon are what the autumn season in Pittsburg means to me. It is the reason I always get on the water no matter what is happening in my life. I would feel a void in my soul if I didn't. I was able to get back on the water a few times during late October and November as well. Yes, those last few fish were not from N.H. They were caught out in New York on the Salmon River. They were just too pretty not to share though! Overall things have finally started to settle down in my life. 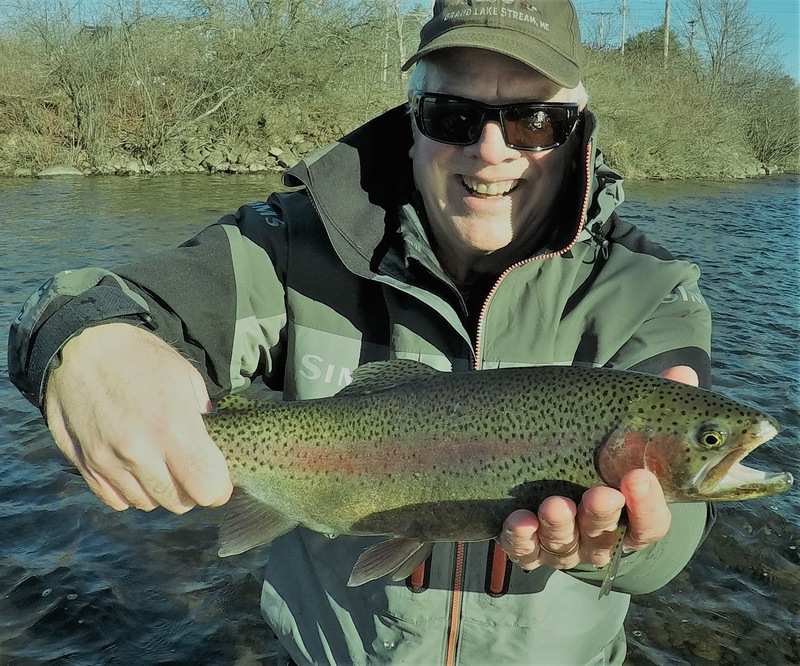 I am hoping that 2018 will bring more wonderful guests to the rivers and streams that I love to share so much. The time to start thinking about booking 2018 trips is now. Each year I have repeat clients who jump on prime fishing dates and get their trips in the books. If you are interested in hearing what I have to offer as a guide and what our trips entail, please feel free to email me anytime! 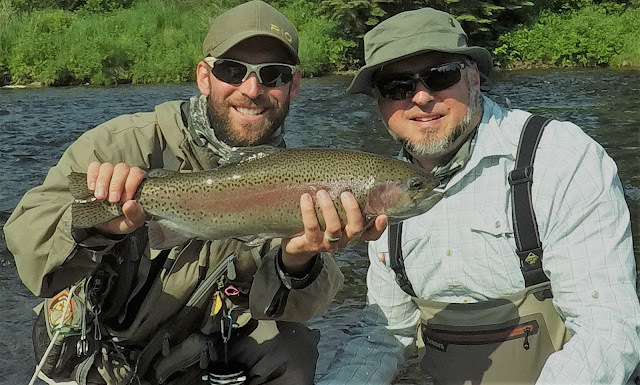 I would love to chat with you and create a plan that helps you fulfill a fly fishing trip that you have always wanted! Keep in touch, happy holidays and hears to a happy new year! Summer has arrived in the North Country. Ask anyone around and they will say that it took a little longer than usual to get here this year. A cold and wet month of May was good for prolonging the salmon run, but it slowed the warming of the rivers as well. The Pittsburg Anglers association once again did a great job with stocking the Trophy Stretch in order to kick off the spring fishing, but the fish that were put in seemed to be a bi tricky to find at first. As May rolled into June the water temps still struggled to reach 55 degrees which was slowing the fishing a bit and the hatches as well. I wrapped up teaching in the middle of June and was itching to move back to my summer home in Pittsburg. With the truck packed to the cap, I was off to continue a tradition of guiding and fishing in my favorite place in the world. 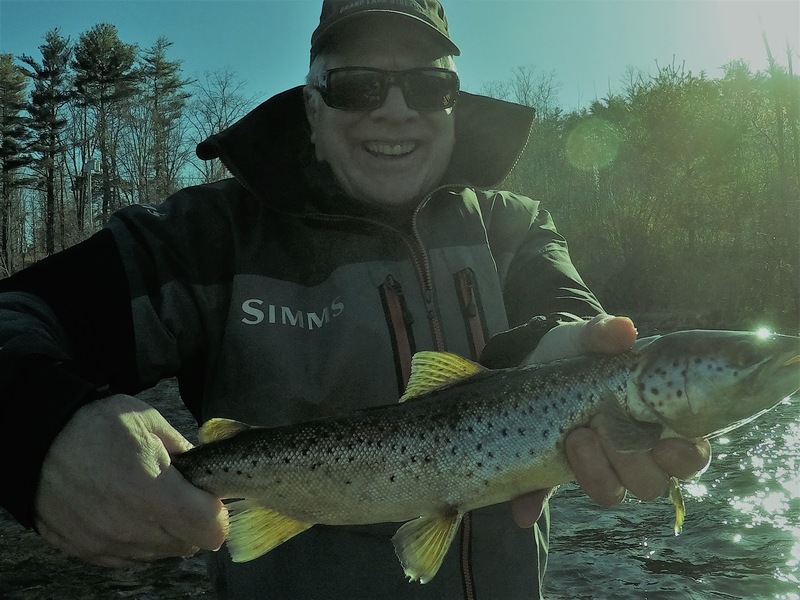 I was guiding within a day of getting here and with two more bonus stockings from NH Fish and Game, the fishing was finally how it should be. Let me re-phrase that. The fishing was UNREAL! I can remember times over the years that the fishing has been great. I think that the fishing in our memories has a way of becoming even better each time that it is recalled, but there have been years that were outstanding. This year, so far, has been the best that I can remember. There are not only LOTS of fish in the river, but there are some absolute MONSTERS in there as well. Some people say, “oh, they are just stocked fish.” While this may be true of some of the huge brook trout caught lately, I don’t care who you are, fighting a 5-6 lb brook trout on a fly rod, in a beautiful river, is just plain fun! Look at the nice colors on that one! For others, the chase for wild or holdover fish is their game. I completely understand this as well. The cool part is that Pittsburg has a huge variety of stocked, holdover and wild fish! I had repeat guests who wanted to do a little more exploring, so we went a bit more out of the way to find some wild fish. The result was spectacular! 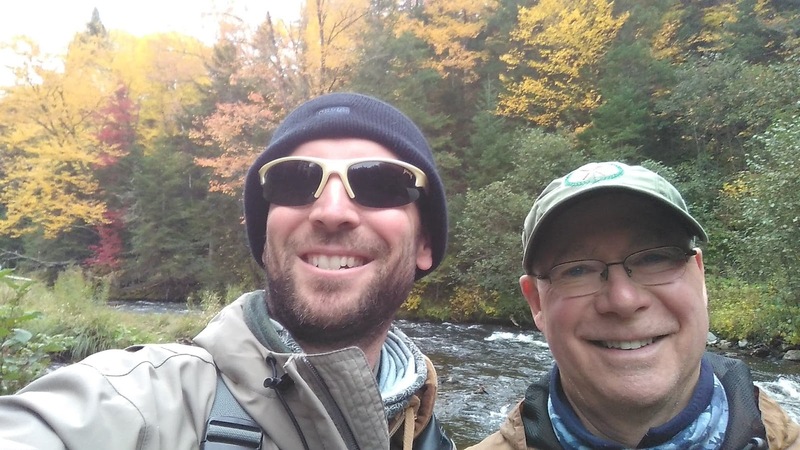 We were hooking and landing Landlocked Salmon and Wild Brook Trout with no one else in sight. Two guests were even lucky enough to break Fish Story Guide Service record fish within a week of each other! First up was Mark with a brook trout that was net measured at 19-20” and most certainly was pushing 5 lbs. It was caught on a black Feedinator in an area that had already been fished before we arrived that morning. We got lucky with this one as we were able to net it before it went down river into the rapids. What a great moment that was. Seeing the excitement and relief that the “fish of a lifetime” was in the net! Just a week later Winslow got in on the action. To be honest we were fishing in a very well known area and had been catching plenty of stocked fish. There was a mix of large brookies in this pool and I actually thought for sure it was another large one when he hooked this fish. Then I saw it leap! Instantly I knew we were into something special for this section of river. After three more drag screaming runs and great angling skill on Winslow’s part, we netted this monster rainbow. 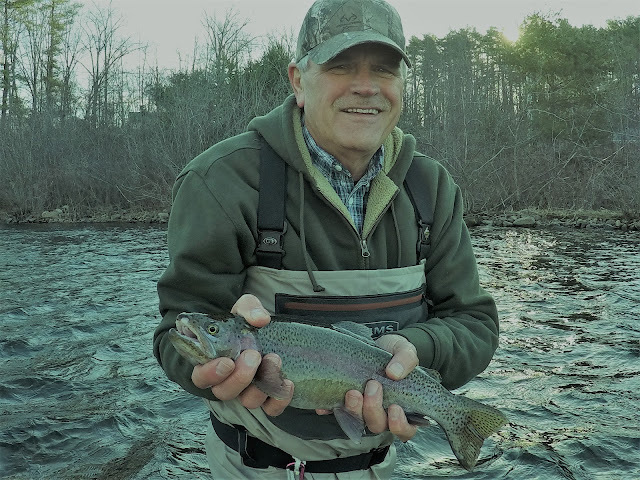 I was second guessing myself as to whether it was just a big rainbow that Fish and Game had thrown in, or if it was a really old holdover fish from years past. Once I got a good look it was pretty clear. The fish had two BAIT hooks stuck in its mouth! The only way that could have happened was if this fish had broken two different anglers off down at the lake and then traveled all the way up into the Trophy Stretch during the spring. A true holdover monster that measured 20” on the nose! What an old warrior this fish was! The Hex Hatch on Back Lake has been a bit slow this year. Actually the hatching of the Hexes seems to be going just great, but the fish just don’t seem to be cueing in on them with reckless abandon like normal. That being said I did get out last night and landed 5 nice rainbows along with a handful of “Red Eyed Demons.” Hitting the Hex Hatch on Back Lake is one of my favorite traditions. It reminds me of fishing with friends and good times on the water. Knowing that around 9:30 we head back to camp for some good food and drinks while we unwind the fish stories of the day, puts my mind at ease. I hope to get back out again before the annual hatch is over. Before I know it, summer will be ending and I will need to take care of business at home, but for the next couple months, I plan to make the best of what Pittsburg has to offer. If you would like to get up and learn about fly fishing in Pittsburg, please feel free to shoot me an email. I do still have some open dates through mid August that I would love to fill! I hope that this entry has ignited that fly fishing spark inside of you and that you will get out on a river and fish! As always, if you see me on the river come over and say hello! Thank you!